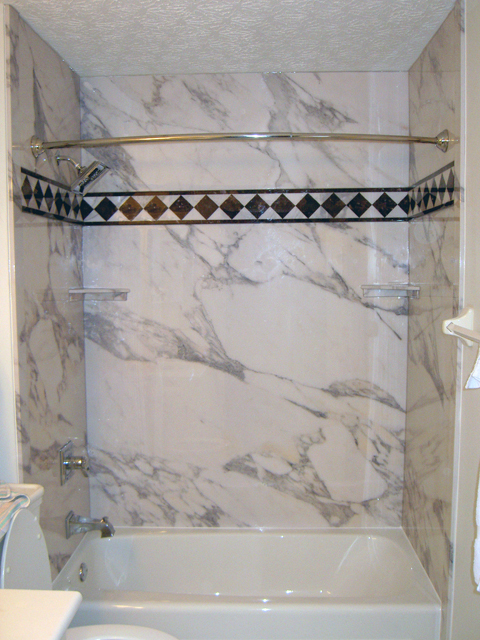 If you’re looking for natural stone, marble or granite wall panels for a bathtub or shower but think you can’t afford it – think again. With the development of a new scratch resistant composite bathroom wall surround system called Sentrel you can get the look of natural stone without the big cost or grout challenges sometimes associated with marble and granite. Outlined below are the frequently answered questions about this system. What is the Sentrel System? – Sentrel is a composite material that won’t attract mold or bacteria that incorporates a high resolution pigment and a digital imaging process to create the look of real stone, marble or granite walls. Where can this material be used? – The most popular uses include shower wall panels, tubs & tub decks, bathroom walls, corner and bench seats and kitchen backslashes – basically anyplace you’re looking to create a stylish surface which may come into contact with water. What kind of product options are available? – Sentrel is available in over 2 dozen natural stone patterns. The most popular ones include Mocha Travertine, Petrafini, Calcutta Gold, Golden Beaches and Breshia Paradiso. To add function and style there is also a large selection of trim moldings, accent strips, and shampoo and soap dishes to compliment this decorative shower wall and tub line. Can this system be installed over old tile? Can it be installed over fiberglass one piece tub/shower units? Yes – Sentrel can be installed over old tile walls (to save the cost and mess of having to remove old tiles) as long as the existing walls are not wet, spongy or bowed. This material cannot be installed existing fiberglass one piece units (in these cases the one piece system is torn out and wall backer will be installed before putting up the Sentel walls. What additional questions or comments do you have about the Sentrel system? Please comment below. 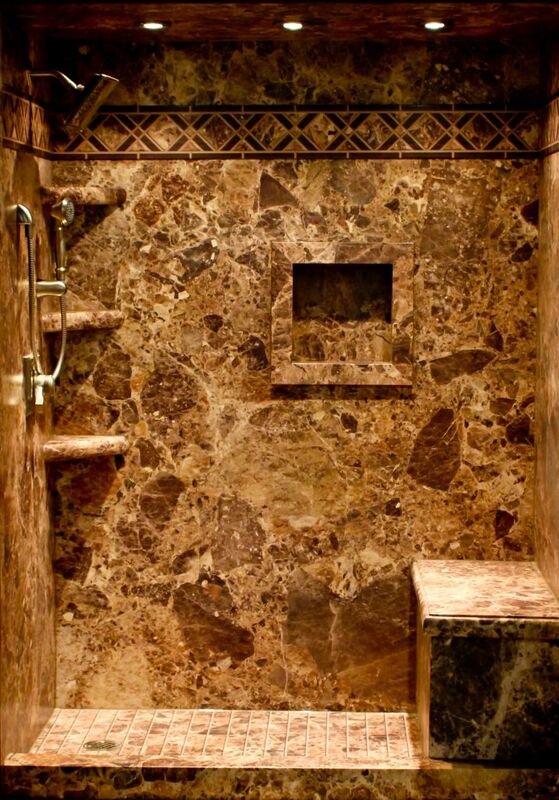 If you’re looking for more information or an estimate to install the decorative Sentrel shower or tub wall panels contact The Bath Doctor of Cleveland (216-531-6085) or Columbus (614-252-7294).For nationwide direct product sales call Innovate Building Solutions (877-668-5888). For complete bathroom remodeling contact Cleveland Design & Remodeling (216-658-1270). Is there a risk of water intrusion in between the old tiles and SENTRELpanels? is the surface l layer of the SENTRELpanel scratch proof? If not, what can be use to erase the scratch? Can the organization insets of the Central panel be customized? What material is used in the seam between floor tiles and the SENTRELpanels? and the seams between SENtrel panels? Is this material likes a caulk or grout and is it mold proof? Can you provide an estimate of how much it would cost to install such a system in a standard sized shower/bath stall in SOUthern California. Thank you. Larry – we would be happy to send you more detailed information and pricing or you can contact us at 877-668-5888.